It’s been surprisingly cold here, less than 10°C during the day. That’s pretty much unheard of, even at this time of year. To keep warm, particularly after some exertions in the fresh air, we’ve been enjoying hearty soups and casseroles. 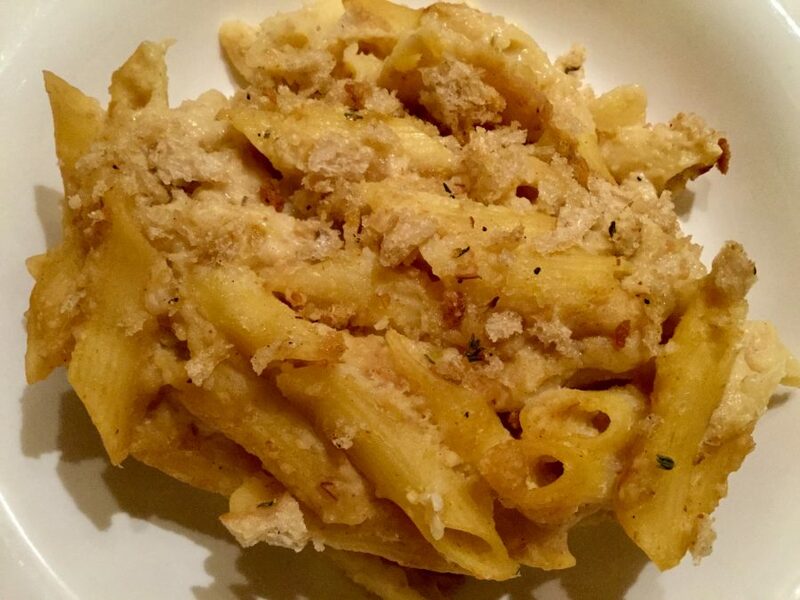 Over the week-end, I decided we deserved some real comfort food and what’s more comforting than macaroni cheese? I looked at a number of “vegan” alternatives and cobbled together something that was absolutely delicious. 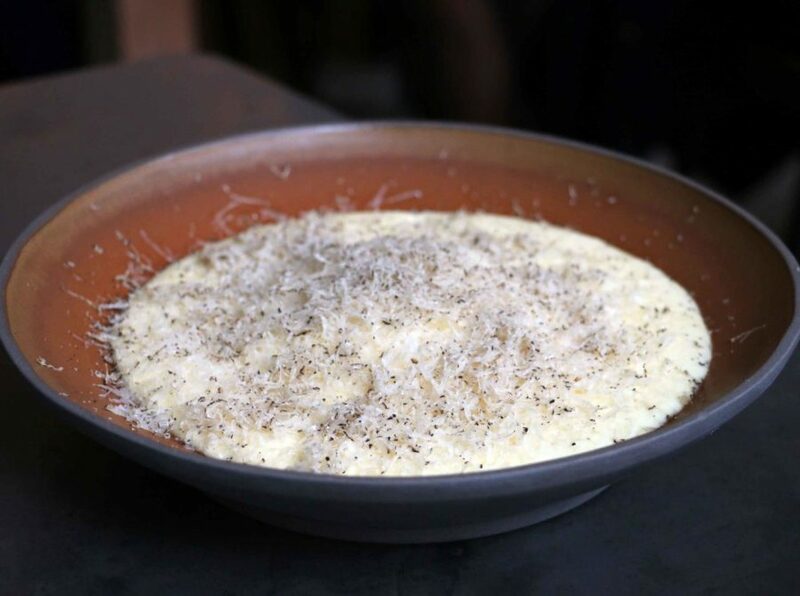 Was it as good as Adam Handling’s (Frog) truffle topped macaroni cheese? Err, no but it was still very tasty. Of course, I could throw caution (and the budget) to the wind and smother it in slices of truffles because everything taste better with them. 1. 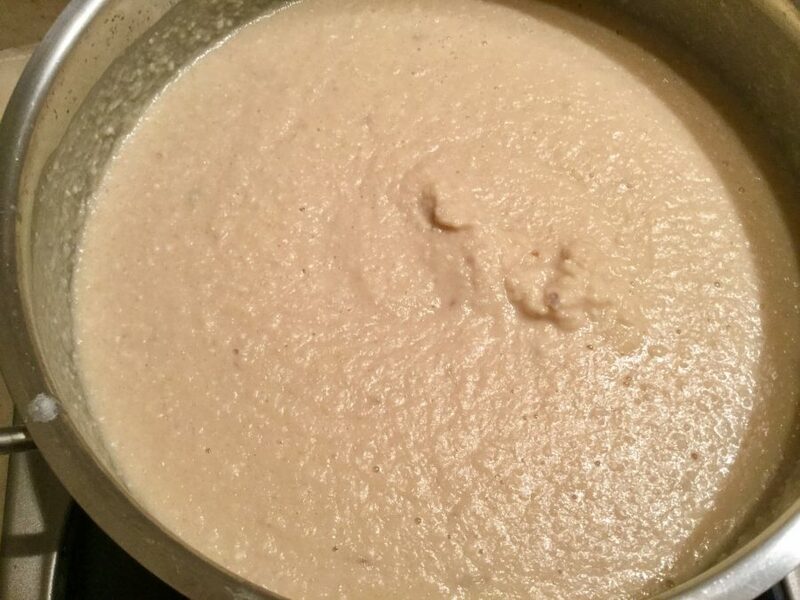 To make the “cheese” sauce, pour the milk into a saucepan, then add the cauliflower, onion, half the garlic and bring to a boil. Reduce to a simmer and cook for approx. 15 minutes, until the cauliflower jhas softened. Allow the vegetables to cool a little. 2. Using an immersion blender, food processor or liquidiser, carefully blend with the tapioca flour, mustard, yeast, vinegar, miso and turmeric. Season to taste. 3. Cook the macaroni in plenty of salted boiling water until only just cooked and still firm to the bite (about half the cooking time stated on the packet). Drain, saving some of the cooking water, and put to one side. 4. 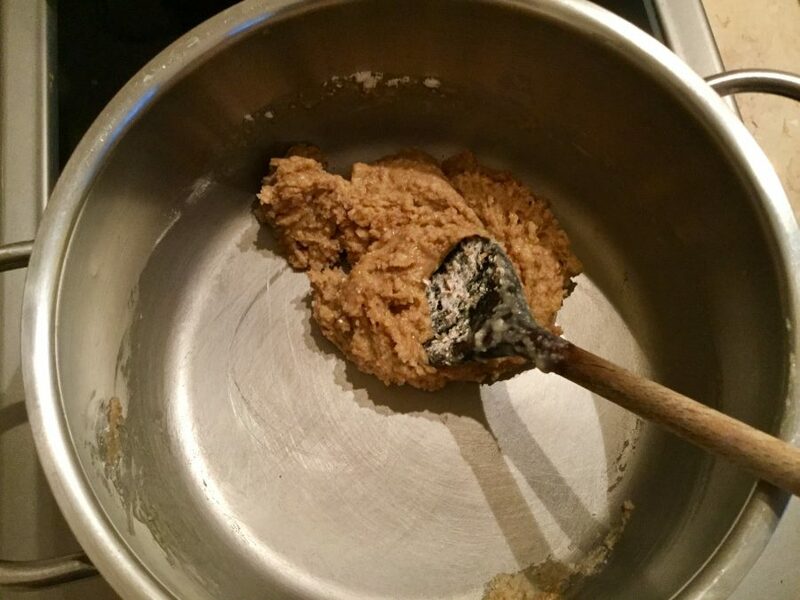 Heat the oil and flour in a heavy-based pan over a low flame, stirring well to make a roux. 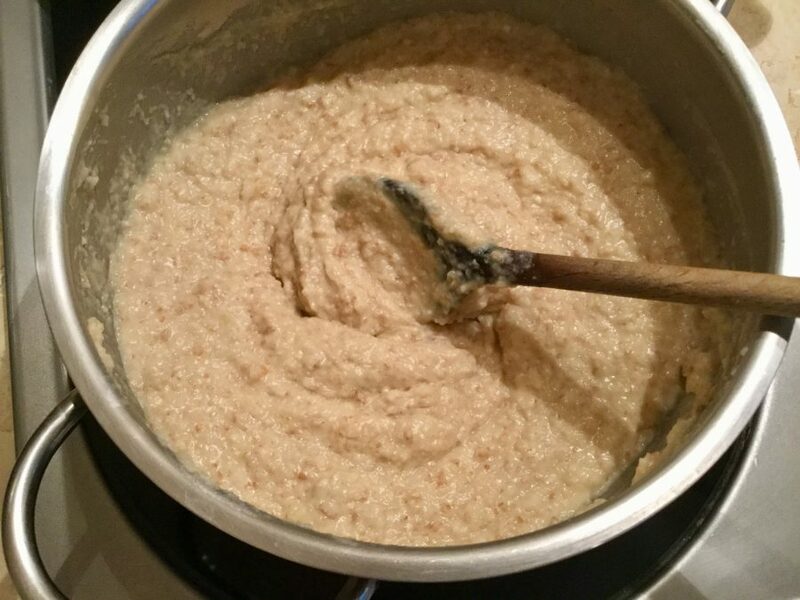 Add a little of the cauliflower mixture at a time, whisking out the lumps, until it is all incorporated. Bring to a low simmer and cook for a few minutes, or until thickened and stretchy. It it’s too thick, add some of the pasta cooking water to thin. Then season to taste again. 5. Add the macaroni and a splash of olive oil, stir to combine, then transfer to a large casserole dish. 6. Heat the oven to 180C (160C fan)/350F/gas 4. Finely chop the herbs and mix into the breadcrumbs with the remaining garlic and a splash of extra-virgin olive oil. Season to taste, then sprinkle over the macaroni and bake for 30 minutes, or until golden and bubbling on top. 1. I was aiming to replicate the look and feel of macaroni cheese. It’s hard to totally replicate the taste without cheese. I found that a tbsp of white miso gave it that missing umami flavour. 2. I would suggest that you taste the “cheese” sauce to ascertain whether you need to add more seasoning. 3. I used cauliflower to give the sauce body but equally you could use a mixture of vegetables. A few carrots or some sweet potato would probably give it more of a cheesy colour. 4. 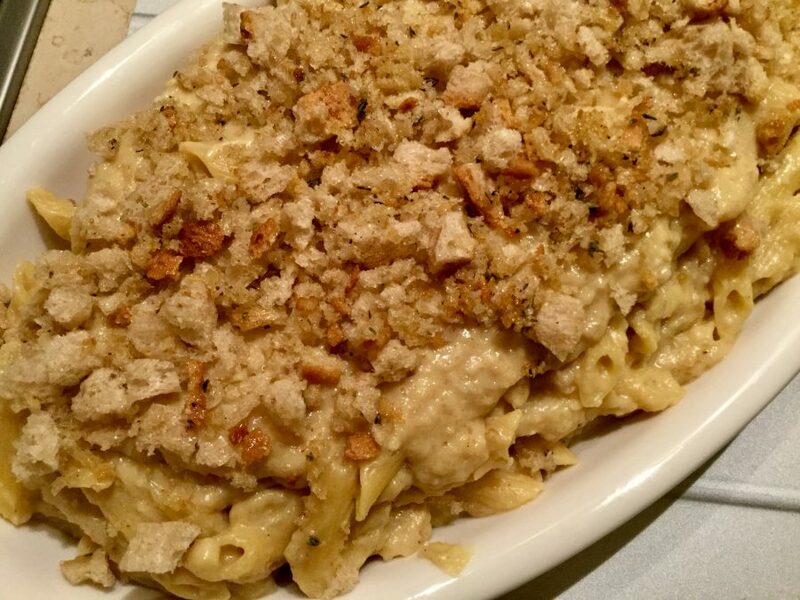 Of course, adding some vegan cheese, particularly mixing it with the breadcrumb topping, would also be delicious. This looks fabulous–what a great way to incorporate cauliflower! Yes yes yes. I’m trying to go vegan, and I’m practicing with recipes. You have me hooked I can’t wait to try this one.